Please Submit Ticket in the Client Area to get SUPPORT from us. Please submit one ticket for each product. All customization works have one month of support after deploy date. To get support after one month, Support Fee will be charged case by case. Each license is for one domain use only. The ticket shall be responded with 1 working day. For customers who bought products from us that did not have Client Area account, please contact us to get one. Each product has one month of support after purchase date. To get support after one month of purchase, please buy Individual Product Support Service for one product or Full Product Support Service for all products you purchased. Product has not been purchased with any Promotion applied, including bulk purchase or Package Pricing. We are given chance to install and resolve the problem with the required ftp and admin access credentials. Major functions of the product do not work well. Refund is requested within 3 business days after purchasing. Installation Service and Mobile Build Service are not refundable in any case. If module was modified but not by YouNet, support service might be restricted partly or totally. YouNet Product does not guarantee its compatibility with 3rd party vendor. Only Owned Software Licenses having active support are eligible for transfer. Owned Software Licenses are only eligible for transfer after at least 3 months from the date of purchase. License Transfer Fee will be charged (currently 20% of transferred License’s price). All transfers are final and cannot be reversed. Before any transfer, please contact us to verify eligibility of your licensed account via ticket in Client Area. Upon request of the transfer, we will issue an invoice for the license transfer fee. Once paid, we will request from you the name, email address and details of the new owner for the license to be transferred to. Subscription can be switched to ONE Time payment at any time. When switching, client will need to pay an amount equal to (full price – discount). The total discount is calculated based on how many months that have been subscribed. For each month of subscription, client will get 10% discount of one-time price and maximum discount is at 50%. Subscription period also includes the time to build applications and submit them to app stores as well as the time waiting for approval from Apple and Google. Once the subscription is canceled / suspended, all of the associated licenses and services will be terminated as well. Applications will be published under YouNet Developer Account. Source Code can only be purchased if you make one-time payment under restricted conditions. Price of source code is NOT included in License Cost ($600). Kindly contact us for more information. 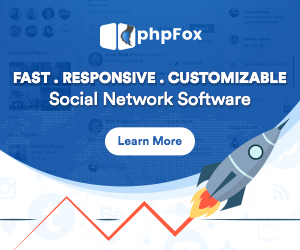 When a user purchases an app by YouNetCo in the phpFox store (located at https://store.phpfox.com), we collect the following information via a webhook Endpoint provided by phpFox Store: purchaser’s Name, purchaser’s Email, purchaser’s active URL, and PayPal’s returned transaction detail. This information is necessary to identify your purchase for supporting. When you contact to get support to get a support or customization service and provide uses some information of email, name, phone number, skype or Paypal email, we may generate a profile in our system to keep the conversation with you smoothly in the ticket or Jira system. YouNet Co uses the personal data you provided only to handle orders, delivers products and services and processes your service requests. We do not share this information with outside parties except to the extent necessary to complete an order or under your permission. You will be provided an account to access personal information in each environment. In case you find that your personal information is incorrect and you want us to update, please contact us by opening a ticket. If you are no longer want to leave your data on our server, please submit a ticket to ask for account removal.